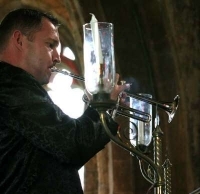 The magical sounds of a church organ and trumpet playing during a wedding service, will add further to the already spectacular surroundings of a church or cathedral. Our church organist and trumpeter will provide you with stately processional and recessional music, along with elegant arias and romances during the signing of the register. Music during the hymns will encourage the congregation to sing to their full potential.